With additional reporting by Cray Allred. Speakers and crowd members expressed hope in the gospel’s power to change lives and communities, but many complained that for centuries, no matter how pure, nonviolent, and prayerful the community at large has been, authorities have continued systems of oppression.Eighteen pastors along with their church members of various denominations and races gathered together Wednesday night in Ferguson, Missouri, not to demonstrate but to pray. At 8:00 p.m., they honored their city’s encouragement to head home. Other churches raised prayer tents around the town. Alpha Omega Theta Christian Fraternity took to the streets along with protestors, but these young men mediated between cops and agitated citizens, offering many demonstrators food and water. If they observed grieving individuals, the students approached to offer prayer and comfort. One member of the fraternity dropped food off at the home of Michael Brown’s family. Ferguson-based Christian leaders, citizens, and law enforcement seem to come to four similar conclusions, all with an underlying question: How can we bring glory to God while pursuing justice? 1. The church helps with hands and feet, not just words. “We want to be known for what we do and not what we’re against,” said Pastor Joe Costephens, pastor of Passage Community Church in Florissant, Missouri, who helped organize a volunteer cleanup on Wednesday attended by more than 120 people. “A lot of churches are known for their public stance instead of service,” Costephens said. Passage Community Church joined other churches in leading a food drive, donating school supplies, and attending neighborhood watch meetings to understand the community’s needs better. “People ask why we are doing this, and we say it’s because we love Jesus and because of that we love you,” Costephens said. 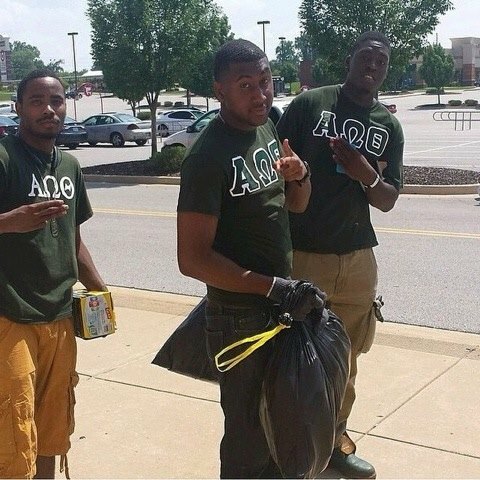 Theophilus Murphy, Jr., was the 2013-14 national president of Alpha Omega Theta Christian Fraternity and a senior at Ranken Technical College. His fraternity became famous this week for a viral Facebook photo of a few of its members serving. “We believe in prayer and putting feet to our prayer,” Murphy said. In addition to handing out food and water, presenting at town hall meetings, and working with local law enforcement, his fraternity plans to raise and donate funds to help with Brown’s funeral costs and the family’s legal fees if necessary. 2. The church does not sensationalize. In the midst of the riots, only a few media outlets discussed the peaceful reactions. The majority of individuals we talked to agreed that the media was portraying a Ferguson different from the one they knew. Many of the more militant demonstrators, including looters, they said, were from out of town. The media has portrayed the citizens of Ferguson as willing to loot liquor stores and bomb the police to preach justice. Church groups worked alongside Nation of Islam and the New Black Panther Party to calm demonstrators. On the streets of Ferguson, citizens complained that the media portrays them as “hoodrats,” and shows their town more severely impoverished than in reality. His fraternity actively worked this week to dissipate energy and work with the county police, utilizing level-headed communication both with demonstrators and police. Murphy observed the physical stance of separation between those distrustful of local law enforcement and others, like his fraternity brothers, who are attempting to mediate and work within the legal system. 3. The church understands the larger picture. Many evangelicals live by the eschatology of the “already and not yet.” This means that the Kingdom of God is already here in part, but will not be fully realized until Christ’s return. As we rush to implement much-needed change, we must act by the “already” and swallow the “not yet.” We should fight for justice, yet realize that the fulfillment of the gospel is the only reality that brings true peace and justice. “Ferguson is ripping the bandages off the racial wounds we thought were healing but instead are full of infection,” writes Trevin Wax at The Gospel Coalition. In fact, we believe that the divide reveals more than wounds, but instead a cycle of self-destructive language. Costephens and Murphy both acted in mediation between the law and the people. Similarly, both emphasized that racial tension was only part of the issue. “It’s the sin underneath the sin,” said Costephens, quoting Pastor Timothy Keller. “Racism is a sin, but there is pride and self-centeredness underneath that. We prayed to repent of our own pride. We must be willing to say ‘I’m sorry,’ be able to forgive and walk arm and arm with people,” he said. 4. The church desires orderly peace and justice. This week, controversial protest organizer and leader of the Black Lawyers For Justice Malik Z. Shabazz called for protestors to “police ourselves. We have to discipline ourselves,” reported The Verge. “We’re for Michael Brown. But we also know that the world is watching us,” Shabazz said. He echoes a sentiment that Murphy finds to be essential as he and his brothers comfort people this week. And while some may find looting an easy outlet, Murphy views prayer as key. On Friday, St. Louis-based hip-hop artist This’l hosted a forum at Friendly Temple Missionary Baptist Church to allow local citizens to voice their feelings of communal pain and lament. Speakers from the forum’s panel and crowd members expressed hope in the gospel’s power to change lives and communities, but many complained that for centuries, no matter how pure, nonviolent, and prayerful the community at large has been, authorities have continued systems of oppression. The New Yorker reports that a movement might be boiling out of the chaos, but how many more movements will be necessary for change—true justice? Those of us who believe in prayer, hope, and redemption should be at the front lines—it is we who contain the drive, the truth, and we who should execute the most effective change. Kara Bettis is a Boston-based reporter and a regular freelancer on topics of faith, politics and culture. So these churches in Ferguson seem to be assuming that Michael Brown was innocent, that the officer who shot him is guilty, and that racism is the underlying cause of the incident. That is neither gracious, wise, loving, or intelligent. Agree. What about the officer who has been tried and convicted already? Why can’t we wait for the facts to come out, and then decide who is guilty? “seemingly unjust” “apparently”… the first two paragraphs of this post had me questioning the everything else that followed. I agree Bryan. As a member of one of the churches, that would be an incorrect assumption about at least some of them. I don’t know what happened that day. I do know that there were underlying racial issues well before last Saturday, and the manner in which we respond will greatly determine how we are perceived. In particular, Pastor Costephens has gone out of his way to not give his support to either side because there is much confusion; instead he has urged people to love thy neighbor- whether police, protester, businessman, or innocent resident. We cannot control the people who are looting. We can clean up, support the business owners, denounce violence, and even advocate for the rights of the peaceful protesters to be heard. And by and large those Fergusonites who are genuinely committed to finding out what happened are NOT looters or instigators. I know it may not look like that from the outside, but it’s the truth. The idea that we cannot clean up Ferguson, collect food for people who need it, or help the looted businesses, or admit that racism it a contributing factor to (at the very least) the events subsequent to the shooting, without tacitly indicting or condemning, the officer, is flat-out wrong. It’s very easy to sit outside and comment on what these churches should or should not do- I would encourage you not to do so. “…his fraternity plans to raise and donate funds to help with Brown’s funeral costs and the family’s legal fees if necessary.”- is anyone serving the officer and his family or is he the bad guy? could this possibly be a difficult situation for him? “If God be for us, than who can be against us?” Murphy said. “[Jesus] didn’t tell us we wouldn’t face persecution. But he tells us in the end not to let that consume us.”- Who is being persecuted? Michael Brown? The police? The protesters? The officer? “Racism is a sin…”- of course it is but who is guilty of it in this situation? is it only the white police who are guilty of it? is it not racist to assume racist motives in the actions of someone simply because they are white? “Speakers from the forum’s panel and crowd members expressed hope in the gospel’s power to change lives and communities, but many complained that for centuries, no matter how pure, nonviolent, and prayerful the community at large has been, authorities have continued systems of oppression.” – Ferguson at large is a pure, nonviolent and prayerful community? Really? It must be the only one in the country. Bryan, your assumption would be incorrect. At least some of these churches and groups are not making the assumption that the officer acted improperly. Maybe some do. But the point of the article is that all of these groups are calling for a peaceful response to both the shooting and the other resulting issues that have surfaced. They are all standing in the gap between the police and the protesters calling for calm and an end to the violence. They are also providing ministry to the community attempting to bringing healing into lives that have been wounded by prejudice, both real and perceived. Some of the pastors quoted in the article are white pastors of predominately white churches.